Fourth Row Center: Film Writings by Jason Bailey: On DVD: "Carnage"
Roman Polanski's Carnage begins at what appears to be the end. Two pairs of parents, the Longstreets (Jodie Foster and John C. Reilly) and the Cowans (Kate Winslet and Christoph Waltz), have met at the former's apartment because their two sons have had a fight. We see that inciting incident at the conclusion of the opening credits, an burst of barbaric but childlike violence. The adults are very much insistent on being, well, adult about the whole thing; they've penned a letter and agree that the boys should meet, under some circumstance, to talk it out. The Cowans put on their coats. But they do not quite make it out the door; something keeps pulling them back in to this little confrontation, which slowly but steadily goes clean out of their control. "We're all decent people, all four of us!" Mr. Longstreet insists, but by that point in the afternoon, he's not even convincing himself. 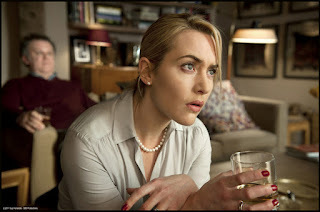 Carnage, which is adapted from the play that became Gods of Carnage on Broadway (with an equally impressive cast that included James Gandolfini, Hope Davis, Jeff Daniels, and Marcia Gay Harden), is a dark comedy of manners; its early scenes are all about unspoken rules of conduct, and its later scenes set about smashing them to bits. Everyone is so polite as it begins--walking away from what appears to be a cell phone call bearing bad news, making chit-chat about the art books on the coffee table ("I see you're an art enthusiast... Bacon?" "Yes, Bacon"). But the longer they stay in that apartment, the more things begin to come to the surface: class rifts, political splits, casual misogyny, base instincts, sheer nastiness. Most importantly, Polanski and his gifted ensemble know that the key to putting across a good comedy is to play it dead serious. ("I don't have a sense of humor," Mrs. Longstreet says at one point, "and I don't want one"). The playing isn't terribly subtle, but it's somehow right; no one is natural, per se, but all are believable, if you know what I mean. These are all actors who know how to underplay, and a straight-faced interpretation of the material could be done (and probably done well), but turned up just a couple of notches, the reality of the situation and the characterizations heightened just so, it becomes something less expected and more interesting. Of the aces cast, Waltz is the standout, wrapping his bass burr around his lines and missing not a one of the comic beats provided by his perpetually buzzing cell phone. Carnage runs a fast, snappy 80 minutes, and its ending is oddly inconclusive, wrapping with a comma rather than a period, the kind of dénouement that's typically more acceptable in the theatre than on screen. On reflection, though, a film like this is less about that destination anyway. It is about the awkwardness and bitterness, the disappointment and rage, the violence and the vomit. Did I mention it's funny? "Carnage" is out tomorrow on DVD and Blu-ray. For full A/V and bonus feature details, read this review on DVD Talk.